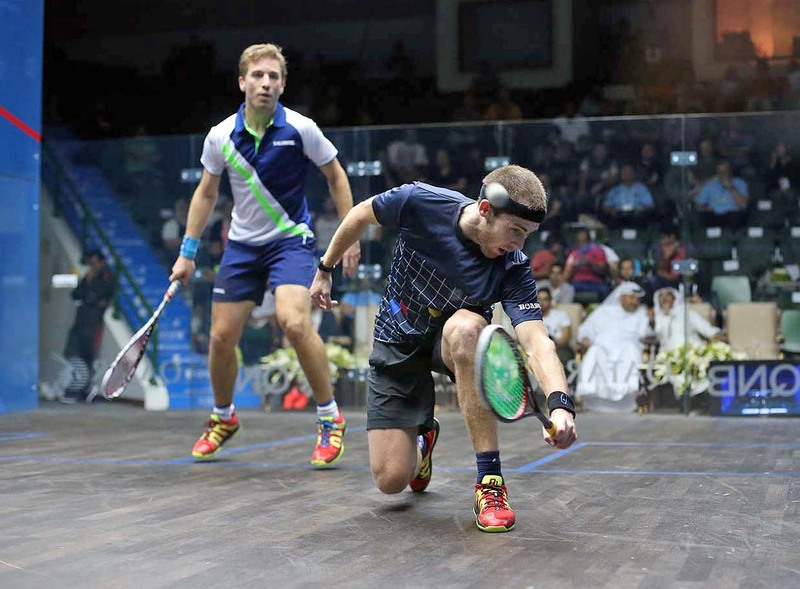 The opening day of main draw action at the 2015 Qatar Classic, PSA World Series tournament, saw half a dozen of the tournament’s top seeds crash out at the first hurdle as the form book got ripped apart in both the men’s and women’s draws at the Khalifa Tennis and Squash Complex, Doha. In the women’s draw India’s Joshana Chinappa set the scene for what was to follow as she dismissed World No.1 Raneem El Welily 3-1 to record one of the biggest wins of her career in the day’s opening matchup. The 29-year-old from Chennai came into the second PSA World Series tournament of the season in form and shot out of the blocks to establish an early two-game lead over an out-of-sorts El Welily – who’s performance was littered with errors throughout – from which the 26-year-old from Alexandria couldn’t recover. “This is by far the best win of my career – it doesn’t get any better than beating the player at the top of the world rankings,” said Chinappa. Chinappa will face Egyptian Yathreb Adel in the second round after she upset the odds to record an emphatic 3-0 win over World No.19 Dipika Pallikal before fellow Egyptian Amina Yousry overcame a gap of over 120 places on the World Rankings to defeat England’s Emily Whitlock in a five-game thriller. Yousry edged the first two games courtesy of tie-breaks in what was an evenly contested and intense battle before Whitlock responded to level the match at 2-2. But 15-year-old Yousry dug deep to take the fifth and record a huge upset. “I’m so happy to have won this match – it’s an amazing feeling,” said Yousry. In the men’s tournament qualifiers Ryan Cuskelly and Mohamed Abouelghar stole the headlines as they dispatched World No.9 Mathieu Castagnet and former World No.1 James Willstrop, respectively. Less than a week since winning the biggest title of his career to date at the Welaptega Bluenose Squash Classic in Canada Cuskelly continued to enjoy his rich vein of form on the other side of the world as he dominated from the outset against Castagnet to record one of the best wins of his career. “That’s a massive win for me,” said Cuskelly. “He’s such a tough guy but once I started to get my rhythm going I was able to attack and that was my game plan. Cuskelly will face England’s Chris Simpson in the second round after the 28-year-old World No.23 eliminated World No.10 Marwan Elshorbagy while Abouelghar will face current World No.1 and Egyptian compatriot Mohamed Elshorbagy. Abouelghar came from two games down against Willstrop to record a 5-11, 9-11, 11-9, 11-3, 11-9 win and will be hoping to carry his form into Monday’s encounter with Elshorbagy. “I am more than happy with my performance today and to come from 2-0 down against someone like James and win is huge for me,” said Abouelghar.